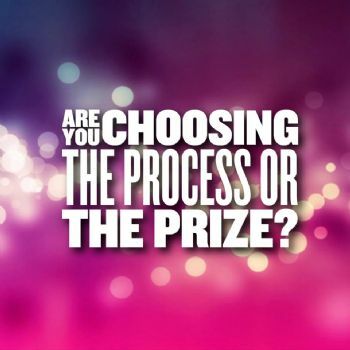 Choosing the Process or the Prize? 2 days out from my meet and I've already won. Last year I competed 6 times and don't remember feeling THIS.EFFING.GOOD. My body didn't get as beat up this training cycle so yeah, that's a plus. But that's not what feels awesome. I'll get to that. Once upon a time the end goal was the MOST.IMPORTANT.THING. I set my target, followed the plan, made progress, got back on track. So why was getting the goal not as super amazing as I thought it would be? Anti-climactic even? I was chronically "so close yet so far." I'd do 5,000 things right, but would beat myself up for the 2 things I didn't do. Hustle and hard work became drudgery instead of a labor of love. Repeat after me: Who you BECOME in the process is the point. The prize is icing on the cake. I set goals because I want to be, do, and have better. Goals are good; I'm not knockin' them. But if reaching a goal doesn't elevate you as a person, is it really worth doing? It's the process, not the prize, that makes you better. 9 years after Matt and I started walking, I'm starting to get it. So let me circle back to why I've already won even though the meet's still 2 days away. Process > Prize has given me more patience, consistency, compassion, surprise... and way less clutching, fear, expectation, criticism. That's a lot more winning than just lifting all the weight (which I'll still do so yay!). Here's something you already know: goals are exciting; they give us a sense of how amazing our life will be when we reach them. They feel good, are flashy, and easy to quantify. To fully unlock their power, use the process of getting them to change you. I repeat: It's who you become in the process that's the point. So who will you become next time you reach a goal? "Who you BECOME in the process is the point. The prize is icing on the cake. " This is a GREAT blog. Absolutely GREAT. Exactly!!! I love this, Z! It's the same thing with weight loss... you can't hope to eat healthy for 1 year, and maintain a healthy body for a lifetime!!! You must live, eat and breathe HEALTHY in order to maintain that!!!! I hope everything worked out for you at your meet! No doubt you rocked it!! !